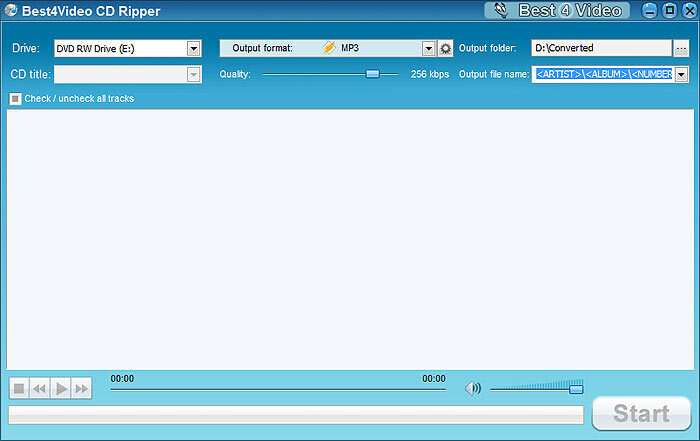 Best4Video Audio CD Ripper is your all-in-one toolkit for ripping, tagging and converting music from any CDs. This modern software allows you to rip your CDs for playback on PC, iPod, iPhone, android, other phones, portable players, etc. Rip CDs to lossless formats and enjoy music in perfect quality. 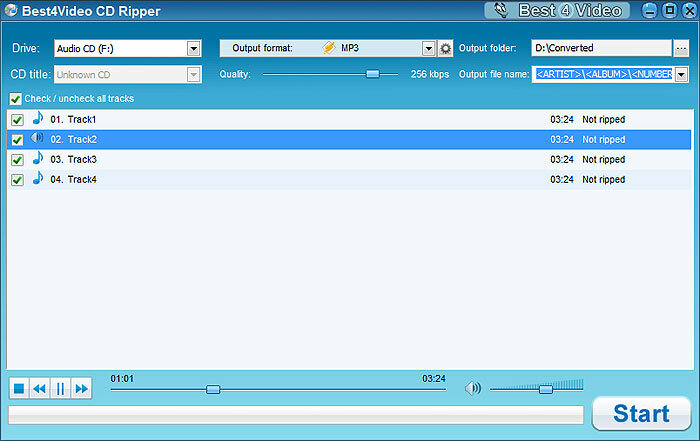 Audio CD Ripper allows you to customize the output settings for exact music formats and quality you want, as automatically tag the songs with the correct song info fetched from the internet. Best4Video Audio CD Ripper uses modern mechanisms to achieve the best ripping speeds among competing products. Despite all its advantages our Audio CD Ripper is offered at a great price! Audio CDs can be ripped to any of the popular lossless and lossy formats: MP3, FLAC, AAC, WMA, WAV, OGG and others. Create your own custom profiles with desired bitrate, sample rate, etc. Complete ripping tasks incredible fast. Compatible with modern devices like iPhone, iPod, iPad, Android, Windows Phone 7, Blackberry – all these output formats are supported. Customizable settings. Access audio bitrate settings, sample rate settings, and much more. Straightforward interface. Simple and intuitive user interface allows you to get things done quickly and go on enjoying your music. Perfect quality. 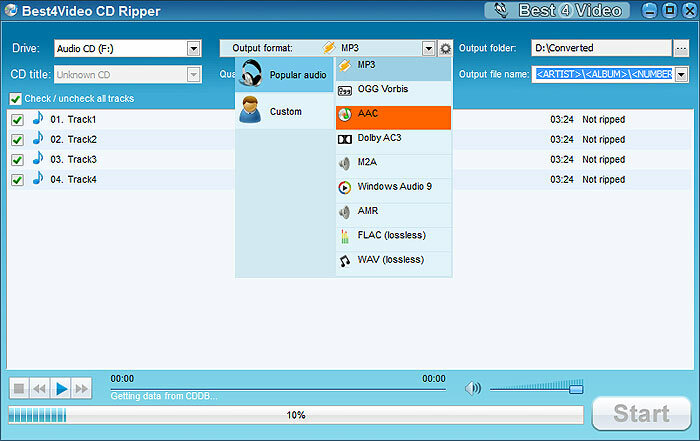 Best4Video Audio CD Ripper provides the ability to rip to FLAC or WAV for perfect audio quality. Very fast speed. The program operates at the highest speed possible depending on your hardware, thus greatly saving your time. DVD Ripper tool allows you to rip unprotected DVDs to AVI, DivX, MPEG, WMV, AVI, MP4. Get a trial period of dvd ripping software tool right now.